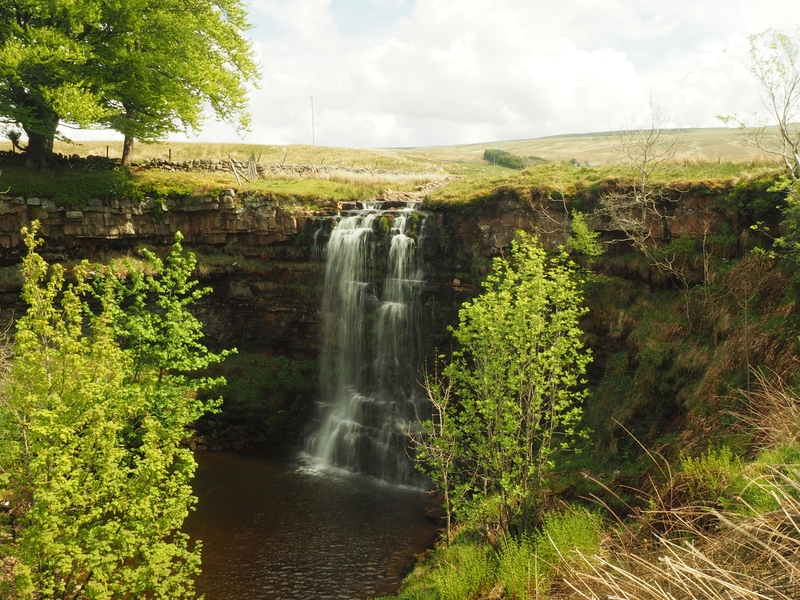 A lovely walk in the Mallerstang valley to visit Hellgill Force, one of Cumbria’s finest waterfalls, before enjoying outstanding views on the high return over the High Way. Prior to this walk I’d not visited Hellgill Force for almost 13 years, when I’d seen it enroute to the top of High Seat. This time I wanted to plan a walk which would explore some of the lower paths that I’d not previously visited. As Mallerstang is quite a long drive for a fairly short walk I decided to make use of the longer days and do not one but two walks, this one and a similar length walk in Grisedale. Starting from the handy little parking space just alongside Thrang Beck I turned right to walk a short distance to a gate on the opposite side of the road. Passing through the gate I dropped down a broad track to cross the River Eden at Thrang Bridge. From here the route of the path across the next few fields to Hazelgill was not particularly clear. Eventually though I arrived at Hazelgill’s driveway. Turning left I once again crossed over the River Eden to arrive back on the road. Turning right a short distance I then took the driveway to Elmgill which was signposted as a bridleway to Hell Gill. The farmyard seemed to be doubling as a scrapyard for cars, some of which looked like they dated back to 1960’s. Above Elmgill care needs to be taken. The track climbing upwards from the farm is not the bridleway, this is a much fainter path marked out irregularly by the odd guidepost. To make matters more confusing new fences have been erected across the route of the bridleway. After having to re-orientate myself several times a clear and more obvious path was encountered near a ruin above Ing Heads. Indeed this was a grand section with fantastic views of the valley dominated by the slopes of Swarth Fell and Wild Boar Fell. Above Hanging Lunds I came across a nice waterfall and caught a fleeting glimpse of a stoat running for cover. After another less than clear section, the bridleway entered more open pastures above Slade Edge and a more solid track that brought me to the ford over Hell Gill Beck. Immediately below the ford is the superb spectacle of Hellgill Force. To fully appreciate the drop into the rocky ampitheatre below cross the ford and turn right. Take care here because not all of the steep sides are fenced off. After enjoying a short break at the waterfall I returned to the track where, at a junction, I turned left on the track leading to the house at Hellgill. Beyond the house a short pasture led to Hellgill Bridge and the Pennine Bridleway. It is worth taking a quick look from the bridge down into the wooded confines of Hell Gill which at this point takes the form of a very narrow gorge. From the bridge the final stage of the walk was a simple stroll along the track known either as The Old Road or The High Way. The track initially crossed Hellgill Wold to reach the Water Cut. The Water Cut is a sculpture by Mary Bourne. The sculpture is the first in a series of ten sculptures called Eden Benchmarks by different artists that are located along the River Eden. From the Water Cut the final mile of the walk was a steady descent enjoying glorious views north up the Mallerstang valley. This led the eye up into the wider Eden valley backed by the distant outline of the Cross Fell range of the North Pennines. Also prominent up to my right were Hangingstone Scar and Mallerstang Edge with the top of High Seat, the fourth highest summit in the Dales, also visible. Despite stretches of less than clear paths in the early stages this was a thoroughly enjoyable walk. I’d driven through some quite torrential rain whilst crossing the A66 and had not been very optimistic about the weather. However, for the first half at least, I’d enjoyed some lovely sunshine. Certainly the weather was better than the afternoon when I drove the short distance to Garsdale Head for my second walk of the day. You can find out how I got on by reading my Grisedale walk report.